Thoughtful posts on why the neopaleolithic viewpoint, while perhaps valid for its adherents, is yet not the way I want my country run. … and I will have a comment for you. 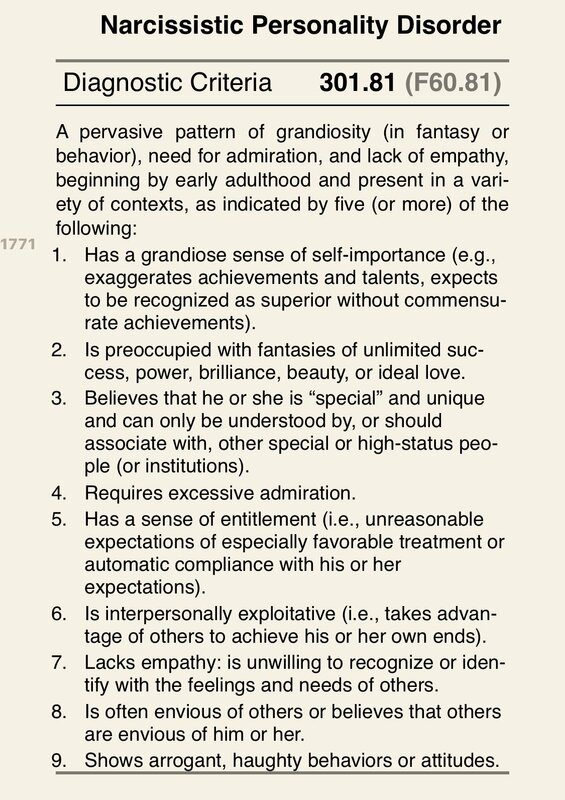 In order to be diagnosed with narcissistic personality disorder, you formerly had to meet five of the following nine criteria. To whom do you think I am referring? These criteria are actually no longer officially used. The Diagnostic and Statistical Manual of Mental Disorders (DSM) revamped the personality disorders for DSM-5 in 2010. Their reclassification met with some criticism for its decision to drop this specific diagnosis from the new edition. But you get the picture. 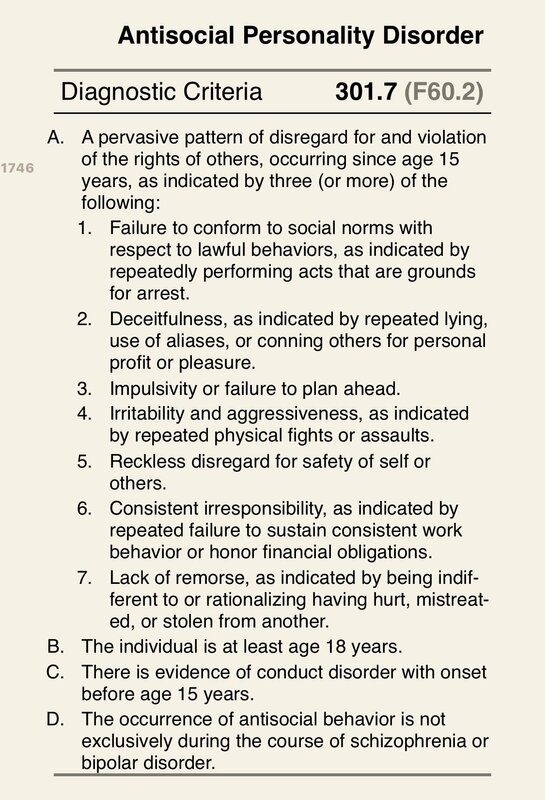 We now await the tapdancing from those who will try to avoid saying they recognize any of these traits in the person I’m talking about, and that it’s just because of my well-known dislike of this person that allows them to answer Question 1 with certainty. After the tsimmis last week of the kid being arrested for not saying the pledge to the flag in a Florida (!) school, I have studiously avoided writing this post — and to be honest I thought I had already written it. But I think the story is worth telling. First, let me state up front that I find this country’s hyper-patriotism more than a little problematic, and the idolatry enveloping the flag is particularly offensive to me since it involves the forced public display of my-country-right-or-wrong-oh-yeah-why-don’t-you-just-move-somewhere-else devotion. Until the early 90s I was agnostic about the pledge. As long as we all understood that it was an empty gesture, who cares? But then something happened that was so vile, so disgustingly hypocritical, that I became about as anti-pledge as you can be. What was going on that had them so enthralled? The Republicans in the House of Representatives had introduced, as was their wont, an amendment to the Constitution to “protect” the flag, and a vote was in process. Let me repeat that: ignoring the fact that the Constitution has never been amended to protect the government from the people — quite the reverse — the Republicans were attempting alter our foundational document to “protect” a piece of cloth. Now, Dale, I hear you asking, how are you so sure that the Republicans were cynically manipulating the legislative process to provide empty talking points to their amygdala-based base? How do I know that they no more cared for “protecting” the flag than they do protecting poor people? Easy. We were watching the vote, remember, and it was slow going as the representatives clicked their little buttons at their desks: yeas and nays slowly edged up. The suspense was palpable. Would the amendment pass? Would it be sent to the states for ratification, where of course state legislators would be too craven to vote against it? An amendment requires two-thirds of both chambers of the Congress to vote for it to be passed, which in the House would be 290 votes. That meant that if it got 146 nay votes, it failed. Slowly the yeas and nays climbed. The yeas were slightly ahead. Savvy political junkies that we were, though, we watched the nays. Suddenly the vote tally clicked to 146 nays. The proposed amendment was dead. In other words, the Republicans didn’t want this thing to pass. If they had wanted it to pass, all those yea votes that rushed into the public record when it was too late to make a difference would have been cast to begin with. They deliberately waited until enough of their peers had the guts to kill it before they cast their vote. Even more: they proposed this pernicious amendment to the Constitution in the first place and brought it to the floor for a vote knowing it should not be passed. That’s how I know the whole pledge thing is a bogus, cynical ploy to suppress dissent, to shame people who think maybe our allegiance is not due to a piece of cloth, to draw a bright circle around those who are uncritically “patriotic” and to keep the rest of us out. I have not said the pledge since then; I refuse to be a part of or to support that sham. Your mileage may vary of course, and I have no objection to your choosing to say the pledge with all your heart. You may however want to think about the fact that the very people who keep telling you that saying the pledge is simple, virtuous patriotism — and anything else is not —have been manipulating you. I’ll let you decide why. Of course it’s a little more complicated than that, but whatever happened was triggered by the flag-worshiping substitute teacher worshipping the flag and not the Constitution for which it stands. 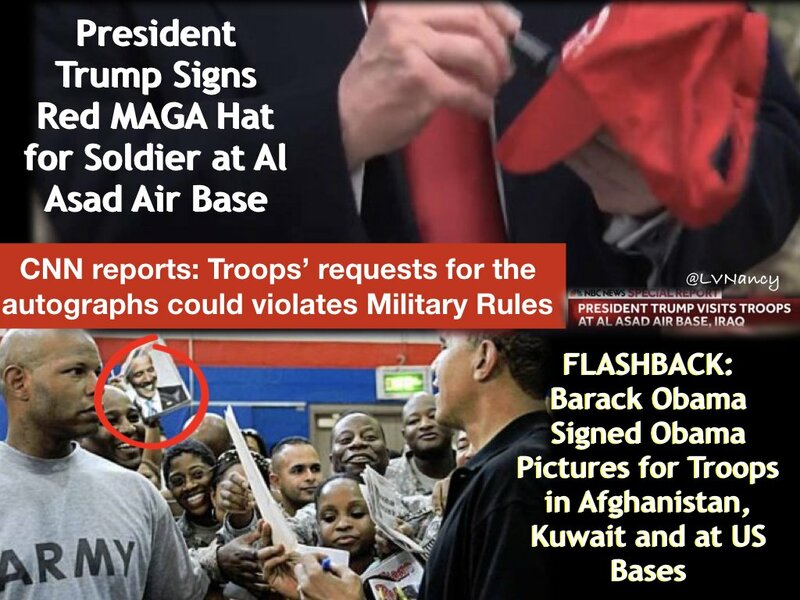 What the Trumpster wants to believe here is that Barry HUSSEIN Obummer also violated military guidelines by autographing a soldier’s hat, so ULTRALIBERAL CNN KENNETH is wrong in calling out Trump (who gasses children) for doing exactly the same thing. The White House (who gasses children) is denying that it brought MAGA hats — which are official Trump campaign items — to Iraq, but there are first-person accounts reporting that yes, they did bring them and pass them out to the troops. That’s a no-no. Trump (who gasses children) signing them just made that fact impossible to ignore. Worse — in my mind — is his behavior on the podium while addressing troops. He was his usual partisan self, bashing Democrats, pushing his Wall, and I have no doubt that if there were an election coming up he would absolutely would have told our troops to vote Republican. Such speech — or rather, attendance at a function where such speech is used — is prohibited by the DoD conduct code. So, to recap, a soldier is permitted to bring a personal item for the president to autograph. Soldiers are not permitted to participate in photo-ops for campaigns, and by providing campaign items to them in full view of the camera, Trump (who gasses children) violated military guidelines. Would Fox News be defending that? We won’t even get into Trump (who gasses children) blowing the cover of a Navy SEAL team. The question there is: Idiot or traitor? But that’s not why I’m here today. Further down Kemp’s page was some innocuous statement about working with all legislators, etc etc, and the comments there were — shall we say — concerning. Most were thankful Kemp had won instead of THE SOCIALIST, KENNETH, and they were being sincere. More than one praised god that they didn’t live in Atlanta. And these frauds with old lucy stole Karen handles seat how many fraud voters did she fly in from Delta state to state and bused in 10 time district to district fraud votes absentee ballot stuffing old abrams still pushing bathhouse barry hussain un aca commercials! Jebus H. Cthulhu. I’m just surprised it’s not in all caps. And I’m supposed to respect and reach out to someone whose thought processes produce this garbage pile of words? No. Sorry, I can’t do it. This woman — and those like her — are just amygdalas with legs and enough fingers to type. She’s willing to believe the most outrageous lies simply because they’re outrageous; she’s getting her daily high of fear and anger. She will never believe the truth; she will never recognize what is actually going on around her. She is swathed a cocoon of ignorance and distrust, and she has no plans or desire to become a butterfly and risk viewing the world from another perspective. All we can do is outvote her and her ilk, and with Kemp in office it’s a pretty sure bet that’s not going to happen. Can you not feel the panic rising? Is your amygdala not entertained? Dogs and cats living together, etc etc. I for one am the outrage. Here are the lies and the complete miscomprehension of basic truths. Pass it on. (1) DEAR RIGHTWING AMYGDALA-BASED LIFEFORM: WE CAPITALIZE CONGRESS AND CONSTITUTION. We generally spell out numbers lower than twenty, too. Thank you. (2) That’s right. They were VOTED INTO CONGRESS. By voters. That’s how it works. (3) It always comes as shocking news to the amygdala-based lifeforms [ABL], but the Bible is a holy text for Muslims too. Just as Christians revere the Old Testament but consider it to have been “superseded” by the New Testament, Muslims consider both Testaments to have been “corrected” and “superseded” by the Q’uran. In other words, just as an ABL would just as soon not swear on a Torah, Muslims would rather use their own holy text. Let’s repeat that last part for the hard-of-thinking: no religious Test shall ever be required as a Qualification to any Office or public Trust under the United States. That’s right, Kenneth, not only is swearing on a Bible not required, such a requirement is prohibited by the Constitution. 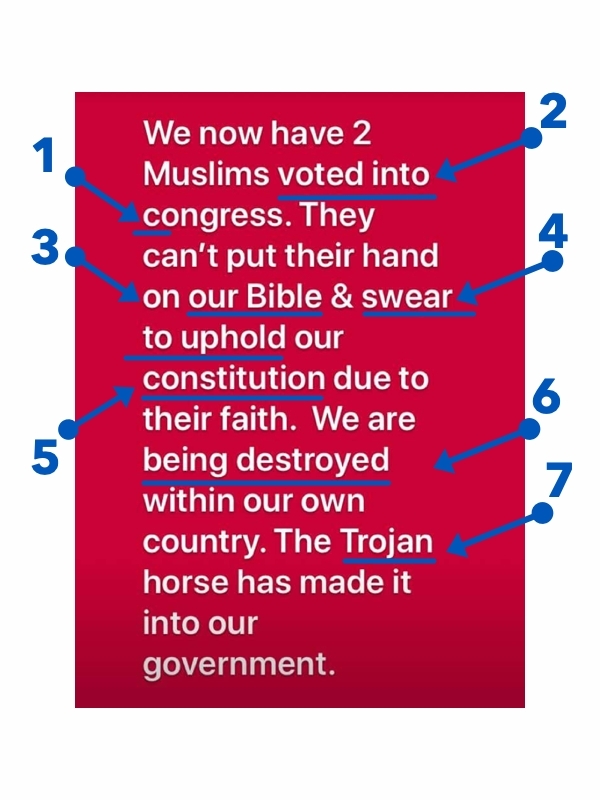 Which all duly elected members of Congress — Muslims or not — swear to uphold. (6) Oh, ABLs. Your palpable fear is ridiculous. I will refrain from commenting on the obvious, and that is if we’re being destroyed within our own country, it’s by the rampant corruption, cruelty, and fecklessness of the current administration and those whose amygdalas salivate like so many Pavlov’s dogs at the sound of Dear Leader’s voice. 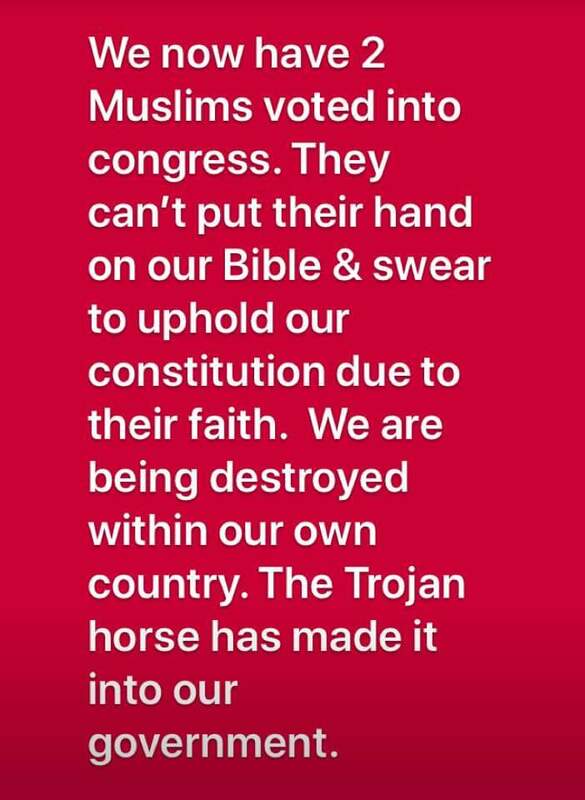 (7) I’m not sure how much of a Trojan horse two members of Congress constitute. I mean, what are they going to do, charge the chair and just take over Congress? Start issuing fatwas from the well? Whip out their scimitars and force the other 536 congresscritters to convert to Islam on the spot (which, by the way, the Q’uran explicitly forbids, no matter what its practitioners have done in history and don’t even get me started about imperialistic Christian missionaries over the last 500 years). The whole tsimiss reminds me of those who are shocked by people who wear shorts to church, or who put sugar on their rice, or who don’t put a salad fork on the table: they somehow think that the world they’ve always felt safe in is actually objective reality. No, sweetie, it’s just the way you’ve done it. Dragging religion into it just elevates the stakes, and Jonathan Swift blew that whole idiotic mindset out of the water in Gulliver’s Travels with his spiteful, petty Lilliput, where the two kingdoms go to war over which end of a boiled egg to crack open. He was referring to the religious wars of the 17th century between Protestants and Catholics, but he would smirkingly recognize the ignorant amgydala-based lifeform who created this graphic as a dyed-in-the-wool Lilliputian. In I, Claudius, the emperor Caligula survives a near-death illness. Afterwards, some toady senator is sucking up to him and avers passionately that he had prayed to the gods to take his life instead of Caligula’s — and Caligula levelly says, “Well, why are you still here then? I’m alive, and it seems wrong to me that both of us should be.” The senator is forced to commit suicide. Caligula takes a statement at face value and pursues it to its excruciatingly logical conclusion. Albert Camus wrote an entire play about Caligula around this very concept. Here’s the deal: I’m sure you’re horrified (as you should be) and condemnatory (as you should be) of what this young man did. I’m sure you’re grateful he didn’t get to go through with it. But are you horrified and condemnatory of why he did it? Of course he’s mentally ill. But is the basis for his actions unfamiliar to you? Were you surprised to find that he thinks that gay people and non-Christian people are “other”? What does your religious environment teach you about those people? I mean, if he had planned to bomb his school because he thought people who liked broccoli deserved to die, you would have shaken your head and thought, perhaps, “That’s just weird.” But gay people and non-Christians — let’s face it, his position on those people is not something you’ve never heard before, is it? I know you condemn his actions, but do you agree with his premises? Is it OK for him to think like that, just not follow through? Is that what your church professes? Before you reach into your pocket for your “Hate the sin, love the sinner” shibboleth, don’t. You’re still drawing a circle around “those people,” and I’m pretty sure — having survived a Baptist upbringing — that you’ve been given explicit instructions about that. Thanks. Glad we could chat. Voter turnout in the world’s greatest democracy is, for some reason, an issue. No, we can’t pass a law making voting mandatory because no one does that. Instead, let’s work with what we have: overwhelming campaign ads/begs/emails/commercials. Rather than trying to get money out of our elections, let’s leverage the disgust and frustration most of us feel every time a new email pings our box. Here’s how: We establish — by law — a national database. When you vote, you’re given a unique code. Using the code, you log into the database and confirm your info: any and all email accounts, phone numbers, cable tv service, anything we can think of where we don’t want to hear from politicians. You click the box, and presto! the politicians are instructed to block their campaigns from contacting you. Think about it. If you vote early, then you get to opt out for the rest of the campaign. Turn, turn, kick, turn — yes, IT WILL WORK! edited to add: I’m thinking the politicians will actually be in favor of this; once we’re off the table they can focus their limited resources on the people who haven’t voted yet. It’s a perfect feedback loop: we get left alone, while the politicians will ratchet up their pressure on the nonvoters to go vote. The more people who vote, the more pressure on the remaining nonvoters. TTKT—YIWW! edited to add also too: The law should also state that voting begins as soon as the campaign does. The United States, in case you were wondering. Lots of people do that, too. The Republican party has been hard at work for years protecting the sanctity of your right to vote. At least that’s what they claim with straight faces in front of the camera. Here’s how you know they’re lying. Republicans want you to believe that your vote is under attack from fraudulent voters, hundreds, thousands, nay millions! of them. They want you to believe that not only do people vote who have no right to do so, but that the Democrats are deliberately letting those people into the country to tip the electoral scales in their favor. And if the data from multiple studies are not convincing, go look at the Heritage Foundation’s page on voter fraud. The Heritage Foundation is the conservative think tank that is source of much mischief in today’s politics, and — in an ironic twist, the source of key provisions in ObamaCare. See the number of PROVEN INSTANCES OF VOTER FRAUD, KENNETH? 1,165!!!!!1!! One thousand, one hundred and sixty-five FRAUDULENT VOTES! PROVEN!!!! Are you not concerned? No, because you are a sane human being and recognize immediately that the number 1,165 is unaccompanied by any context. Is this in one election? Or is it across the country over a period of years out of hundreds of millions of votes? You can’t tell from their page, nor can you tell if you click on your state: all you get is a list of offenders without which elections they occurred in, nor what years. If you actually download the “report,” you get nothing more than a list of those 1,165 instances, separated out by state. There is no compilation or analysis of data, only dire warnings that this list is a “sampling” of the “many ways” voter fraud occurs. In other words, complete and utter fuppery. But let’s back up and pretend that the Republicans are genuinely concerned about voter fraud. Given that the amygdala-based lifeforms that make up the Republican Party need fear and anger to feed their brains, this is not an unreasonable assumption. However, this is not the case. They’re lying. Example 1: Here in Georgia, leaving aside Sec. of State Kemp’s documented attempts to purge voters from the roles, we have the example of Randolph County, majority black population. A consultant hired by the county advised them to close seven out of nine polling places in the county, based on the facts that some of them were underused and others were not ADA compliant. Example 2: In North Dakota, the (Republican-controlled) legislature passed a “voter-identification law” that “requires that… IDs have street addresses printed on them and specifically bans using a P.O. Box.” And wouldn’t you know it, many Native Americans living on reservations do not have street addresses; they live so far out in the boonies that they have P.O. boxes instead. 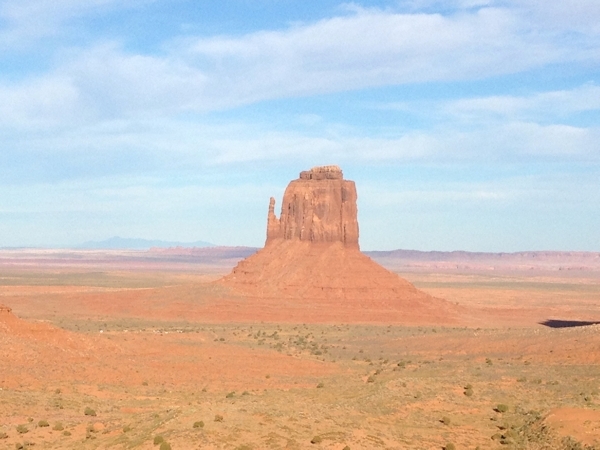 And in what is an amazing coincidence, Native Americans tend to vote Democratic. See those little white dots in the lower left? Those are trailers. Do they look as if they have street addresses? So here’s the deal. Sometimes it occurs that after legislation is passed, the Law of Unintended Consequences kicks in and problems that the lawmakers didn’t foresee crawl to the surface. You would hope that we elected smarter people to handle this, but here we are. But they don’t. Indeed, they fight tooth and nail to preserve those unintended consequences. Because — and follow this closely — these are not unintended consequences. The Republicans pass these laws specifically to exclude certain voters from voting. They’re lying if they say otherwise. Brown people. They mean brown people. The individual mandate was the Heritage Foundation’s response to Hillary Clinton’s healthcare proposal back in the 90s. They weren’t about to let all those poor people get free healthcare, so they put in the individual mandate so that everyone would have “skin in the game” (and still allow the insurance companies to feed off our healthcare). After Mittens Romney instituted the plan in Massachusetts and it worked, Barack Obama adapted it for the Affordable Care Act. Suddenly the idea was anathema to the weasels at Heritage because freedumz. Odd, that. Seven of Nine? Really, Republicans? I voted yesterday. Normally I don’t do early voting, but this year’s election has driven saner men than I to desperation. In all the contested races I voted for the Democrat because oh my god have you seen those other guys? But what to do when an incumbent Republican is running unopposed? Here’s what I did: I clicked on WRITE-IN and wrote in NONE OF THE ABOVE. Easy. Does it count? No. But imagine if everyone who didn’t want the unopposed candidate wrote in NONE OF THE ABOVE — how wondrous would it be if an unopposed candidate got fewer votes than NONE OF THE ABOVE? It might even make the Democratic Party decide they could run on progressive issues and take seats from these fuppers. Full disclosure: there were several unopposed Republican incumbents for whom I voted because I know they are not crazy right-wingers. But I still wish I had had a progressive candidate to vote for. And no, it’s not going to be me, so don’t ask. Ocasio-Cortez’s second comment kind of sums up my reaction to D’Souza, but there’s more to it, I think. His entire attitude — and not just in this tweet — is Ayn Randian to the max: there are weak and there are strong, and the strong are good, vital, and important. The weak are there only to serve the strong. 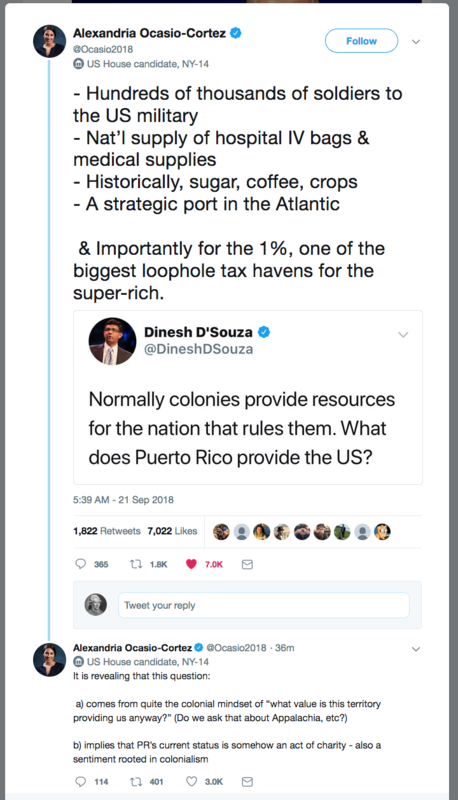 Look at his language: ‘colony,’ ‘provide resources,’ ‘rule.’ Holy crap, people, it’s unvarnished colonialism, and he means it as a good thing. Remember the TV series V? D’Souza would have sided with the aliens. That is not a strained metaphor. He is stating pointblank that if our “colony” has nothing more to provide us — and that is clearly his rhetorical presumption — we should abandon them to their fate now that we’ve stripped them of what we needed. They are of no benefit to us; therefore let them die and decrease the surplus population. This is a worldview that I want to see exterminated. They are not our colony and never were. They were Spain’s colony; they are our territory, and that quasi-legal status is a whole other issue.